I am a homeowner that has several questions regarding natural gas piping in general and a few specific. First of all we have CSST piping. It would appear that we have 1/2 inch coming up through the wall to the main shut off for the gas. We have an outside regulator. After the shut off there are fittings and a black iron elbow that is fairly large with fittings that goes directly into a 5 PSI regulator -- then almost immediately another black iron elbow -- off of that there is a 3/4 inch CSST pipe that goes directly into the boiler . There is also a T off of that black iron fitting that goes directly into a manifold. Off the manifold are 1/2 inch CSST supplies to a Fireplace probably 30 feet away 35,000 BTU, gas cooktop (which I abandoned) and a 40 gallon hot water heater which has been replaced by a Rinnai tankless which is 180,000 BTUs -- they did not change out the CSST pipling -- still 1/2 inch. In the Rinnai book it says it should be 3/4 inch but they are saying that 1/2 is okay. Originally I had a 3 psi regulator and found out after they installed the tankless system it was undersized. They came back and put in a 5 psi regulator The regulator is big enough I think on the outlet side for all the attached appliances at full load. I am just concerned now about the pipe sizing that was used by both the builder and the installer of the tankless system. 1. You cannot go from a 1/2 inch line o a 3/4 inch line -- is that true? The 3/4 inch CSST pipe feeds an 80,000 BTU boiler which is about 10 feet away from the PSI regulator. 3. Also I was told that at least 10 inches of straight pipe needs to be on either side of the psi regulator before the elbow. Every single picture of the installation of a regulator I saw on the internet did have straight pipe. I am being told by the builder that it is not true or necessary. From the outside regulator to where all this stuff sits (up on the second floor) is a fairly long way up. I have no idea how much CSST there is or how it run because it is behind walls. I would think that as a rough estimate maybe it is 60 feet away from the outside service. There are absolutely NO inspections by the utility company, by the county or any other agency. If the plumber does not do the proper job you have no way of knowing except by researching and hopefully nice people in the know respond. I am very concerned that this was not done correctly. I just need some idea of what the implications might be. All seems to be working but I am concered that there could be potential problems. Any help would be so very very much appreciated. Just remember to not use super technical terms as I would not understand it. I am still trying to understand the difference between Water Column and PSI! Thanks again -- I have attached a picture of the lines. Hope this helps. On the right is the line with the shut off. The line all the way to the left is the line that goes to the boiler. The three down the middle -- one goes to the fireplace. One was actually disconnected (it is still shown connected in this picture) and the 3rd one goes to the Rinnai. Again those 2 are 1/2 inch CSST and the line coming up is 1/2 inch. Dont confuse psi with inches of water column ( w.c.) most residential and small commercial bldgs have low press. gas service to the bldg regulator ( 14 inches or 1/2 a pound ) 5 psi could be considered medium press. gas, you could have med press. you should contact your gas co. to get this info and have them sign off on this piping, looks a little sketchy to me. Was that work done by a licensed plumber? I have three certifications for CSST. I did not pass the course with the information you list. Munchkins REQUIRE full size 3/4" IPS pipe to the gas valve, which is 1/2". If your "General Contractor" doesn't have a CSST certification card in his possession, showing that he was trained to install CSST gas pipe systems, he has no business making prognostications of what is right (it isn't) and what isn't. The same with the installer, whomever that may have been. What State or Jurisdiction do you live in? is this natural gas or LP gas? In other words, does the gas come from a pipe in the street or do you have your own gas tank? In response to your set of questions. They were supposed to have certification but that may not be. The house is a tract house and the builder looked for the lowest bid. I seriously doubt they checked any certifications. That is just a guess. I know you have to have a certification to buy CSST but that does not mean that the person who installed it had the certification. I have a house in Bridgeville Delaware which is in Sussex County. I found out that the CSST was not bounded! The County did not require it but the manufacturer does and there was a fire in our community due to lightning and it not being bounded. I had mine bounded. They now have added CSST bonding to the code. We have natural gas supplied by Chesapeake Utilities. I have "begged" them to come and analyze the house -- all are the same. They will not! I am still trying to find out what the pressure is coming into the house. Chesapeake told one of the builders I think last year they had to start putting in 5 PSI regulators because they have increased the pressure on their transmission line. They told them to go back and correct the others that were 3 PSI. They would not but in their defense codes do change but they also refused to send notifications to the homeowners. Now I do not think that is right either. The builder said it is not a problem. I am not sure if there are consequences of not having a properly sized regulator on the inlet side. Can it cause a serious safety issue? This is how bad it is there. I had to figure out that the 3 PSI regulator was undersized on the outlet side once I had the Rinnai put in. Again I "supposed" used a licensed plumber. It even leaked gas and they had to come back. I am so sorry now that I put it in because of all the other issues. And from what I read in the book they said it had to have 3/4 inch CSST line -- again this plumber said no even when I showed him in the book. I even called Rinnai and they refused to tell me. I just know that it is producing hot water. Not sure if it is just a recommendation to have 3/4 inch line or it is a must and what is the implication if the line is not the right size. I am so uncomfortable with the service people in the area. And there are NO inspections by any agency or the Utility company. This is so scary. Gas can be so dangerous! I am still concerned that the regulator itself was not installed correctly only because every single diagram from every single regulator mfg shows straight pipe on both sides of the regulator. I was told again it was not necessary. I wish I could just find someone really knowledgeable about natural gas -- a person who knows the correct calculations. I cannot get one person in my community to join the cause -- they feel that as long as it works everything is just fine. I know better. My dad (God rest his soul) knew natural gas inside and out and even testified in a major gas explosion in NYC. I really wish I could understand more of this stuff but it is a real science and not everything is black or white and I am not qualified to say "this has not been installed right and needs to be redone". I only believe there are problems. There is a 3/4 inch CSST pipe going into the Munchkin but the supply from the street is 1/2 inch and I am not sure one can go from 1/2 inch to 3/4 inch. But again I am not a licensed plumber so perhaps it is okay. Just not sure. If you can direct me on any of this -- what to read or where to go I sure will. You may have some issues. More info is needed. 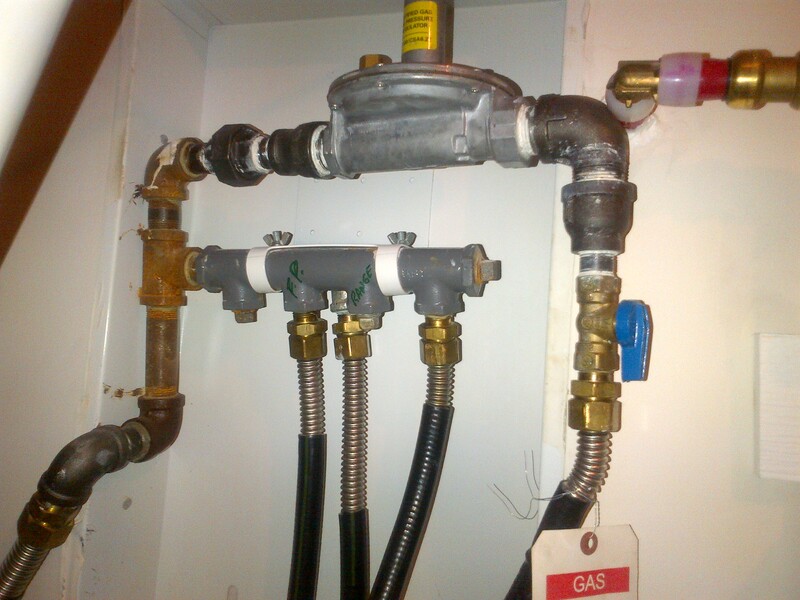 1. gas pipe sizes and length of the runs to each appliance from the manifold. 2. BTU ratings for each appliance. 3. The gas piping for your boiler should be a mimimun of 3/4" , maybe larger depending on the lenght of run. 4. your tankless water heater needs a minimum of 3/4" pipe, probably larger. 5. what is the model of the regulator at the maniflold and the PSI feeding it? It's certainly not how new construction is handled here. I have heard of the gas co. running 2 lb into an older residence for a plumber. It's usually to get around repiping to all the appliances because something new is being added, but then each appliance has to be regulated.It seems your utility has a very strange attitude about their responsibility. It's like....here's the gas, you're on your own! I'm just a homeowner with some experience building, and it seems very odd. When I tell people how it is in 'SLOWER LOWER' Delaware I think they think I am kidding. There are few inspections and even they are suspect. They are supposed to inspect the foundation, the framing, the electrical and the plumbing. I had electrical work done and found out from the "licensed" electrician that there was no electrical box behind several of the fixtures and the fixtures did not have them either (which would be acceptable). Of course I had him put them in. Can you believe that they left out a structural support for the upstairs dormer in all the homes of our model! It was in the blueprints - they did not ask for a modification. How did it pass inspection? They had to come back and retrofit all the homes and some are still not right. Fortunately mine is okay (at least for now). The mechanical systems are NOT inspected and the only thing that is done regarding gas service is that they check that the lines hold the pressure -- yet there have been gas leaks I understand as well. That is why I am so concerned about all of this. I just do not understand the lack of concern. Not until 12 people died in 2 separate fires that were close in time did a code get put in that new homes had to have smoke detectors and there still is no code for carbon monoxide detectors! I put them in but in this day and age they should be code. I am just so dismayed that there is this lack of concern and lack of regulation to help to protect the residents. Get it grounded, per the code and per the manufacturer ASAP, because if you don't, and heaven forbid, you have a "situation" involving the tubing and lightning, and your home burns down, your insurance company COULD exclude you from coverage due to improper installation. There HAS to be SOME kind of building authority in your region that can help. City, County, township, State? The gas could should be VERY interested, because even tho they may not have installed it, they are responsible for maintaining a safe operating condition. Are there also smaller regulators at each appliance?Is there no regulator at the gas meter? I had the CSST bonded -- it is done outside at the service. I had a licensed electrician do it so I am okay there. I downloaded the manual from TracPipe the maker of the CSST that is installed in my home. It would appear that we have high pressure gas 2 PSI. That is why we have a regulator inside the house. But I still have the question as to whether the regulator was truly installed correctly -- if you look back at my original post you can see the regulator. The other issue is can you can from 1/2 inch to 3/4 inch. And I honestly now believe that the company that installed the Rinnai screwed up. Not only did they not put on 3/4 inch CSST to the appliance itself but when you add up the number of BTUs of all the appliances then you have to run a new 3/4 line from the outside service to carry the load of all the gas appliances. What I do not know now is the implications of all of this. It makes more sense, that they would increase the pressure when they added the Rinnai. It allows you to keep the existing piping,running 2 lb to each appliance and regulating to 1/2 lb at each appliance. The way they have done it, and the fact it's all CSST, it makes no sense at all. I believe, and the plumbers will correct me if I'm wrong, the only concern is you may not get the necessary btus out of the appliances. I don't believe there is any danger.